One of the best ways for the church today to understand her mission is to take a closer look at the life of Jesus. 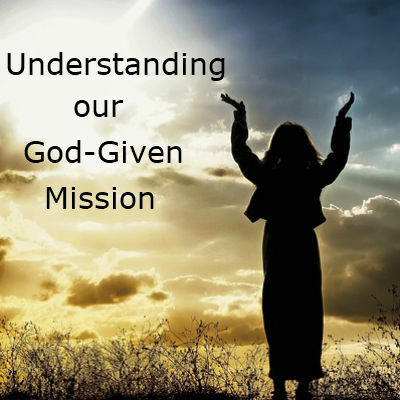 When Jesus came, Understanding our God-Given Mission, he was all about fulfilling his mission for the glory of God the Father. When you are not sure what your mission as followers of Jesus is in this world, look at Jesus. The church is the incarnation of Jesus in the world. The church is called the body of Christ; we are to let Jesus live through us, serve through us, love through us. It is through the church that people will get to know God (Eph.3:10). God has always been on mission and he has always used people to accomplish it. It was to his disciples that Jesus said, “as the Father sent me, so I am sending you. John 20:21. God wants to reach every person in the world and he has chosen his followers (you and me) for this task. We are God’s representatives in this world. Jesus was on mission and he has given it to his followers to accomplish. Then Jesus began to call people to become his disciples, his followers. The call the discipleship is for everyone. Jesus is calling everyone to follow him, to become his disciples. The first followers Jesus called were fishermen, Peter, Andrew, James and John. Their business was fishing; they were experienced fishermen in the sea of Galilee. They knew what was the best time for fishing, how to prepare their nets; they also knew the right bait to use. This is what they knew what to do. Discipleship is a life-long commitment to following Jesus and learning from him. I will make you become fishers of people. These disciples knew how to catch fish, but they had no idea how to catch people for God’s kingdom. Jesus called them to equip them. These fishermen left their nets behind; they left their boats and their father behind. In following Jesus, you may require you to leave your old job behind; your friends; your family. I know people who have to change their friends once they began to follow Jesus; other have changed jobs. These fishermen were truly committed to following Jesus for what they left behind; following Jesus and getting to know him was more important to them than their own jobs. They left everything to follow Jesus. Matt.19:27 Peter answered him, “we have left everything to follow you! What then will there be for us? Half-hearted followers don’t stick around when things get tough. At one point in Jesus’ ministry his teaching offended many people who had been following him, then they no longer followed Jesus. John 6:66-67 Jesus asked the Twelve if they wanted to leave also. The twelve recognized that only Jesus had words of eternal life and they didn’t leave. Following Jesus is a life-long commitment that not everyone is ready for. What is Jesus calling you to leave behind? To change? Follow me and I will teach you how to catch people. How did Jesus equip his followers to be fishers of men? –Jesus called them to follow him. -Jesus called them to be with him. They followed Jesus everywhere he went. They learned from Jesus by being with him; they were intentional about wanting to be with him. They heard Jesus’ teaching and saw his interaction with people. They saw Jesus having compassion on people and hanging out with the outcast. Jesus didn’t take them to a class for how to evangelize; Jesus modeled it for about 3 years. Jesus himself was intentional about fulfilling his mission and showing his followers that they too must be intentional in their approach to reach others. Jesus modeled for us how to reach the world for him. He is calling you right where you are to become his follower, to be intentional about seeking those who don’t know God. God is calling you where you are to be a committed disciple to his kingdom. Jesus calls people everywhere to follow him to be with him, to learn from and to be sent by him to reach the world for him. A follower of Jesus who is not on mission truly doesn’t know Jesus, for Jesus has always been on mission.